In a group as packed with weirdos as Batman's Rogue's Gallery is, it takes some effort to stand out. In some cases, that means a really clever gimmick; in others, a really bad one. Though Jeph Loeb seems to be a fairly big fan of the Mad Hatter, Jervis really didn't have much of a role in the writer's biggest hit, Long Halloween. He just helped Scarecrow rob a bank under orders from Carmine Falcone, then got sent back to Arkham. Okay, he did almost get to kill Batman, which is still tons more than he got to do in Dark Victory, but that's small comfort. Nevertheless, we got a figure of this minor rogue in the first series of the Long Halloween figures, alongside such notables as Catwoman and Two-Face. Like the rest of the figures in this line, even Batman himself, the Mad Hatter is too short. Of course, that works for him, since he's always been terribly diminutive in the comics and was particularly dwarven in Tim Sale's artwork. Counting the hat that adds more than an inch to his height, he's 5" tall - so, "extra petite." Articulation is acceptable, if nothing else: he moves at the neck, shoulders, elbows, wrists and hips, with not a balljoint in the lot. The sculpt is nice enough, but he has the same exaggerated, wide-legged stance as the rest of these toys seem to suffer from. His itsy little suit is sculpted nicely, with wrinkles on the sleeves and bunching above his shoes. The gigantic hat has the same stylized proportions that you'd demand from a character based on Lewis Carrol, and his face - tucked away behind the huge collar on his shirt - is angry and angular. Mad Hatter's paint apps are really good - all the figures in this line are. He's all in green, though varying shades. The green used for his coat and hat is truly ugly, while the harlequin pattern on his pants and vest is incredibly crisp. His bowtie is polkadotted, and his white spats really continue all the way under his glossy black shoes. The big 10/6 sign in the hatband is sculpted in place, but the letters are painted well, and his small eyes sink darkly into his face beneath bushy grey eyebrows. Jervis has two acessories - or maybe three, if you want to count the Mar 17 calendar page as an accessory. Since he wasn't even in Long Halloween at that point, it doesn't really make sense for him. Anyway, the two good pieces are a revolver and a teacup. The gun is nearly as long as Hatter's arm, but his right hand is sculpted to hold it perfectly - right down to the extended pinky finger, which wraps around the pistol grip. The teacup, only about 7mm in diameter, can be clutched gingerly in his left hand. There's a small crack sculpted in the cup, and the interior is painted to look stained with use. Very nice, but also very easy to lose. 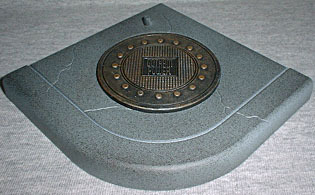 The final piece in the package is a display base. 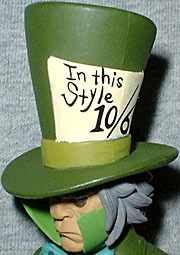 Like a lot of recent DCD figures, Mad Hatter gets one of the plain "sidewalk" sections that the company loves so much. A lot of fans hate these reused bases, but really, they make sense: they give some stylistic unity to the figures, and in cases like this, where one is included with a remarkably small figure, we get something extra - witness the Carrie Kelly Robin, who was entirely miniscule and came with a huge glow-in-the-dark streetlight to add to her base. Anyway, Jervis has a corner with a nicely detailed manhole cover. 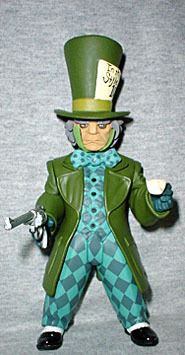 Mad Hatter may not be a top-level baddie - mind-control hats have nothing on mass murder - but the figure looks good and will fill a definite hole in a Batman collection. Just keep an eye on that teacup, or it'll end up in the vacuum cleaner.